This approach allows developers to keep vast portion of their code cross-platform, and diverge with vendor-specific native code only where it is absolutely necessary. The most popular framework for building such applications is PhoneGap / Apache Cordova, which makes development and deployment extremely easy. Zip up the HTML and the script files. Upload them to the PhoneGap build cloud service. Take the android package and install it! And well, this is only the beginning. We will guide you through this steps to get hands-on experience with JayData and mobile application development. To create an HTML5-based hybrid mobile application, we have to follow only a few easy steps. 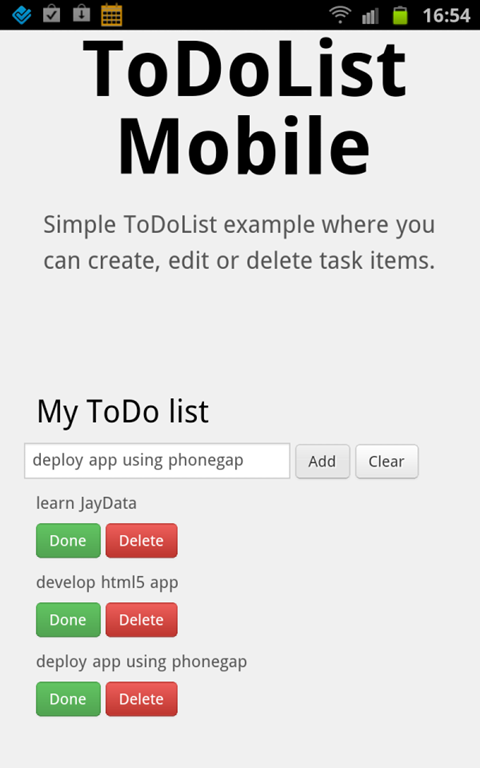 First, we will develop an HTML5 ToDo list application, after this, we will deploy it using PhoneGap. 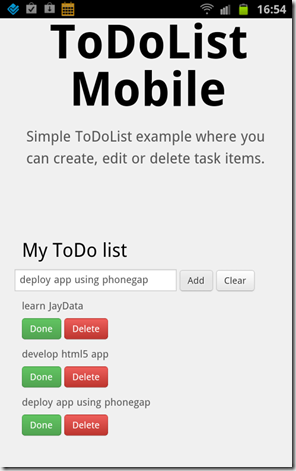 After this section, you will have a basic ToDo list application running in desktop/mobile browsers. The application will store the ToDo list items in the WebSQL database of the web browser and will be packed to a mobile application in the next section. To have a sneak preview of the working example, check out the web-based version. Defining a TodoEntry type with JayData API we will have a class defition and a database structure, too. We will keep these TodoEntry object instances in a collection of the context. To make this happen we define our custom context deriving from the $data.EntityContext type. Our first feature will be to save new ToDo items to the WebSQL datastore. Since we created the entity model and context object our job is easy just like below. To apply this snippet to our application, we will save the ToDoEntry item with the description from textbox (filled by the user) and the current date. textbox (filled by the user) and the current date. We are done with the data management part of our application there is only one thing left: to assign operations to the onClick event of the buttons. Now we have a working application, which can be tested on desktop browsers and mobile browsers. We are ready to navigate to our file system and pack our application to a jaydata-example.ziparchive file. In this section we will show how easy it is to deliver our HTML5 application developed with JayData library to mobile platforms. We will guide you through the most efficient way to pack your app to different platforms. 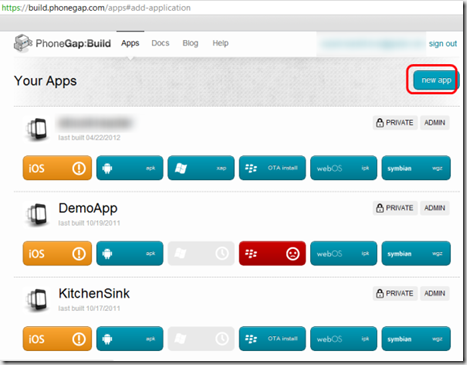 PhoneGap offers the online build service with free trial. To try the online build, navigate to https://build.phonegap.com/and register a new account. After the registration you are able to create new apps on the UI, let’s click the new app button in the top-right corner. After clicking the new app button you will see the following modal window. After filling the name textbox choose the third upload method: upload an archive or index.html file. 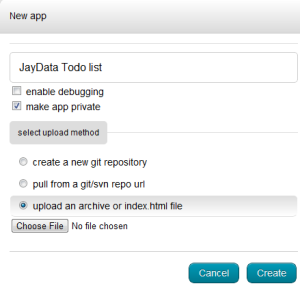 After clicking the Choose File button, upload the jaydata-example.ziparchive. 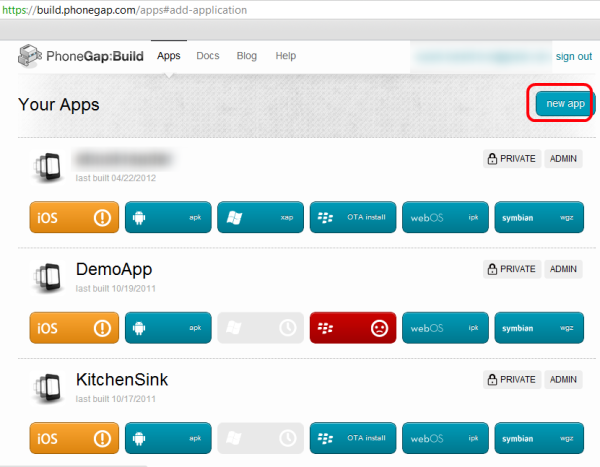 The PhoneGap build creates the packages for each platform. After downloading the Android package, we can copy the APK file to our device.